What's Wrong With a Museum of French History? Will France Americanize Its Legal System? Georges Pompidou had his controversial cultural center. Jacques Chirac got his showcase of indigenous art. And in between François Mitterrand left his imprint on Paris with a veritable building binge that included the Louvre pyramid, Bastille Opera, and Arch at la Défense. Given the grand construction legacies of his predecessors, is there anything unusual about current French President Nicolas Sarkozy's effort to create a new museum dedicated to French history? "There is no place to contemplate the history of France in its totality," Sarkozy said in a Jan. 13 address on culture in the southern city of Nîmes, where he had traveled to announce his idea for what's been dubbed la Maison de l'Histoire de France. "We have no big museum worthy of that name. There are several ideas on this, and they must be debated. We need a bit of arguing about this." As any student of French history knows, it doesn't require a presidential order to generate argument about a proposal  especially one that detractors suspect is fueled by political motives. Sarkozy, political opponents allege, is using the museum push as another sop to voters on the hard right, many of whom fear French culture and tradition are being over-run by immigration and globalization. That demographic includes hundreds of thousands of former supporters of Jean-Marie Le Pen, who backed Sarkozy's 2007 presidential bid after he promised to combat authorized and illegal immigration alike, and to impose order on France's ethnically diverse suburban housing projects. Once in office, Sarkozy has delivered on those pledges  and then some. His creation of a "Ministry of Immigration and National Identity", for example, was applauded by rightists and deplored on the left with equal vigor  and for the same reason: the notion that safeguarding French identity is directly tied to controlling foreigners coming to France. In his push to create a museum, opponents say that Sarkozy will pillage other collections to create the illusion of a unified and coherent vision of French history, a past that is actually very diverse, complex and chaotic. "A single venue dedicated to the history of France makes no sense, and is even dangerous in seeking to create a single, global, and unique (national) history," curator, scholar, and former Picasso Museum director Jean Clair told the Journal du Dimanche. "It's totally a incomprehensible project, because all museums are historical." Sarkozy says that's nonsense. A museum would actually assemble far-flung works, artifacts, and resources in one place to allow scholars to further examine and challenge interpretations of French history, he argues, and not tie it to a single perspective. "The idea is not to create an official history or to keep up arguments over how things are remembered," Sarkozy said in Nîmes, "but rather to develop a scientific, comparative and pluralist approach." Given the breadth and depth of French history it's inevitable that assembling even a snapshot of it under a single Parisian roof would require gigantic effort. Whatever building is chosen is sure to be massively transformed as well. 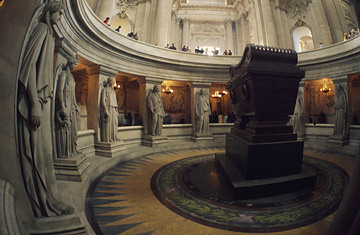 Perhaps la Maison de l'Histoire de France may end up serving as the monument to Sarkozy's presidency after all. See pictures of The Louvre. See pictures of Sarkozy in the U.K.